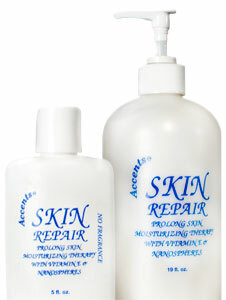 Accent’s Skin Repair provides long-lasting, time-released skin moisturizing therapy to the body, face and hands for over eight hours, even after washing. With regular use, skin is transformed to its softest, most supple, youthful best! Vitamins A & E promotes decreases in lipid peroxidation which is believed to be one of the possible causes of cell membrane damages in skin tissues. Panthenol is a deep penetrating moisturizer that stimulates cellular proliferation and aids in tissue repair.